Everest or Solu-Khumbu region lies on the eastern part of Nepal. The region, which has some of the world’s tallest peaks gained fame with the identification of the world’s tallest peak Mount Everest (8848m). Solukhumbu is home to picturesque Sherpa villages (Lukla, Namche, Lobuche, Khumjung, Tengboche, Pheriche etc), Sagarmatha National Park - a UNESCO World Heritage Center and several high Himalayan peaks, including three of the 14 eight thousand meter peaks - Mount Everest (8848), Lhotse (8516m) and Cho Oyu (8210m). Other peaks in the region frequented by trekkers and climbers include Ama Dablam (6856m), Pumori (7161m), Lobuche( 6119m),Cholatse (6440m), Kwangde (6011m), Mera Peak (6654m) and Island Peak( 6173m). 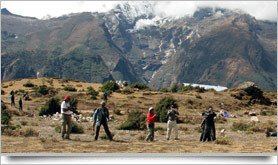 Everest Region is also the site for the highest skydiving event in the world, Everest Skydive. 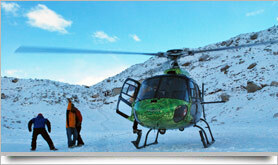 Nepal Helicopter tour to the Everest region includes a lot of particular tours enlisted below. This unforgettable aerial journey takes you to the historic site of the ‘World's Highest Cabinet meeting’ at Kala Patthar plateau, EBC where on 4th December, 2009 ministers of Nepal Government held the world's highest cabinet meeting to raise concerns over the melting of the Himalayan Glaciers due to global warming. The visit to Kalapatthar (17192 ft / 5242m) included two Aircrafts - AS 350 B3 Helicopter and Pilatus PC-6 single engine Aircraft. During this Kathmandu Syangboche flight, we fly eastwards towards the Everest Region. Enjoying the splendid mountain scenery and picturesque scenes we finally reach Syangboche (3700m). Syangboche,a tiny Sherpa village and one of the venue for the world’s highest skydiving event Everest Skydive, lies directly above Namche Bazaar(3450m). There is a small take off and landing airport at the place. From here you can enjoy close Views of Ama Dablam, Mount Everest, Pumori, Nuptse and Lhotse. This flight takes a duration of about 2.5 hours. 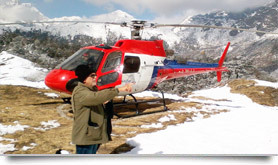 The heli tour to lukla is a 2 hour flight from Kathmandu. 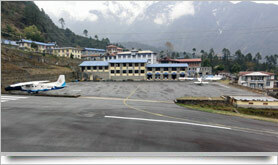 Lukla is a village in Khumbu region at 2900m, which boasts of the region’s sole airport. The STOL airport in Lukla was built in 1964 by Sir Edmund Hillary as part of his project in Khumbu region during the early 60s to transport supplies for the Himalayan Trust projects in the Khumbu region. Today, somewhere between 90-95% of the foreign nationals who reach Lukla, arrive by a half hour flight from Kathmandu. After landing at the airport, you can spend your time exploring the village, taking pictures, enjoying the splendid mountain views before flying back to Kathmandu.